The University of Kansas Health System has the only nationally-verified level one trauma unit in the Kansas City area. That comes with a staff well-trained to handle anything that comes through their doors, including gunshot wounds. KANSAS CITY, Mo. — The University of Kansas Health System has the only nationally-verified level one trauma unit in the Kansas City area. That comes with a staff well-trained to handle anything that comes through their doors, including gunshot wounds. From July 2016 to June 2017, 149 gunshot victims were admitted at the KU Health System. The next fiscal year, that number jumped nearly 10 percent to 163. 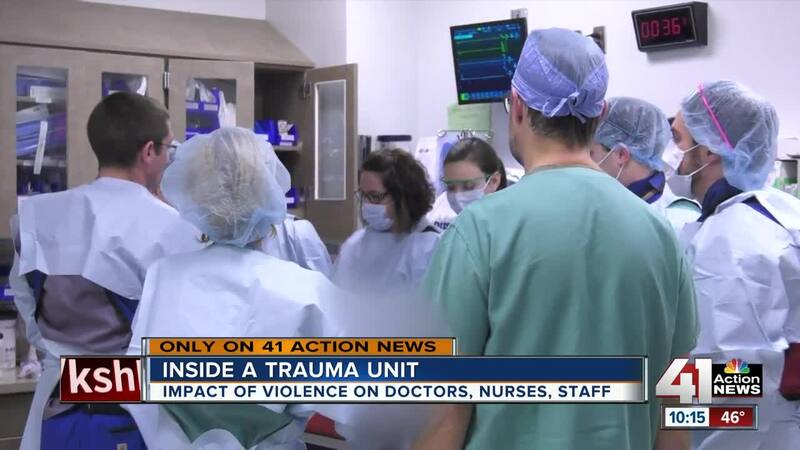 "I don't ever think you get used to it regardless of your background or the experience you bring to the table," Chief of Trauma, Dr. Justin Green said. The American Journal of Epidemiology found people in the U.S. suffered more than 1.3 million gunshot wounds from 2001 to 2013. Kansas City is feeling the weight of the increase. Aimee Canada, an emergency room supervisor at the KU Health System, said, "The younger ones really have an impact on us because it's sad that these people are getting into violence that young." "Kids are tough. First responders, fire, EMS, law enforcement. It's tough when those guys and ladies get hurt. That really hurts you," Green said. There are resources for staff treating the victims of gun violence in the metro, including counseling. Green stressed that the increased violence affects each person differently, but as a staff, he said, "We get through it because you have to."